FFFC: Please introduce yourself to our readers. SH: Hello all! My name is Shakirah Hameed, and I’m a runner. I know that must sound like I should be in an anonymous group with some undisclosed addiction, but actually that would be a pretty accurate description. From 9-5, I’m a graphic designer for one of the largest CPG (Consumer Packaged Goods) companies in the country. After that, my running addiction is in full effect. Someone spiked the Kool-Aid, and I was all in. FFFC: How and why did you get started running? SH: Like so many, I ran track/cross country during my high school years. I actually played high school basketball for a short stint first. Can’t say that I made a big impact in that sport, so we’ll just sweep that under the carpet for a minute. Coincidentally, a track coach was present at a game one day, and watched me hustle for a loose ball. Needless to say, I was recruited to join the track team as a sprinter, hurdler and high jumper, and the rest was history. SH: Over the years, I ran on and off, or when I was inspired to move something. I can say that I had a svelte athletic build then, but age and life caught up with me. I was sidelined after having 2 major surgeries in 2 years. The recoveries were devastating, and I had to take a 2 year hiatus from running. So, no real exercising, unhealthy eating habits and boredom equaled, well, a “not in high school anymore” body. Not being satisfied with my overall health and body image, I vowed last year on my 38th birthday, to rededicate myself to running consistently and eating healthier. It’s been a whirlwind, but I haven’t looked back since. SH: Running is therapeutic and a mental test, if you’re into that sort of thing like myself. It’s the calm and the storm through an unfamiliar distance. It’s the win you’ve never had in any contest, and you win all the time. Who doesn’t like winning? It’s the yes I can in the sea of doubt and silent haters. It’s the pop your collar moment after you’ve met and surpassed your goals. It’s the conversation about you…your race, your pace. FFFC: What is the furthest distance or longest time you have run? SH: My furthest distance to date is 20 miles. I’m almost at the end of my marathon training, and will be running the Philadelphia Marathon, November 17th, as my first marathon. This experience has been life altering, and I never imagined that I could do this. FFFC: Do you belong to a running group? Show’em some love right here. 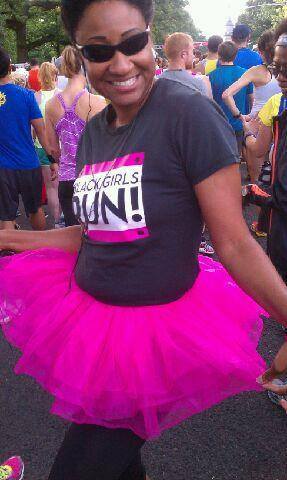 SH: Big shout out to my crew and run partners, the ladies of Black Girls Run South New Jersey (BGR)! Whoop, whoop!!!! 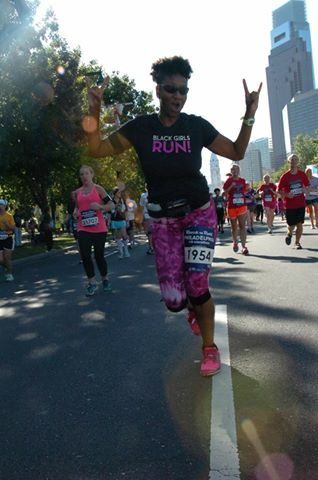 BGR expands throughout the states, and I appreciate all of the support from my BGR sisters (sistahs). The support, encouragement and sisterhood is unparalleled! Our motto is “No Woman Left Behind”! That means, comes hell or high water, there will always be someone to help you through a race and support your efforts in achieving your goals. FFFC: What do you do to stay in tip top running shape (exercise, nutrition, etc.)? FFFC: Do you follow any pre or post run routine to prevent injury? SH: Aah running and injury. If you ask around, most runners would tell you that they hate to stretch. But as someone who has been dealing with a knee injury, properly stretching before and after a run is absolutely necessary. I have a good relationship with the floor from being on it while stretching. Warm up walks or runs are good to get the body warm and the blood flowing. I want to incorporate Yoga into my regimen. I’ve taken one hot yoga class, and I’d have to say that the benefits were immediately felt afterwards. Although I’ve never seen myself sweat like that before, and I was absolutely convinced that I was melting, I’m probably going to try this again after I run this marathon. Other runners will gladly attest to its benefits. Sweat profusely on purpose today, increased flexibility and less injury tomorrow. I’ll take it! FFFC: What was the biggest challenge when you started running or still is even now? SH: Aside from running being a healthy sport overall, it is still a mental thing. When I finally started running again, I set unnecessary pressure on myself to be able to run as fast and far as used to. I’ve abandoned that, and just try to enjoy the experience of running. I do have real running goals, but I do what I’m capable of doing as best as I can, utilizing and trusting my training. FFFC: Have you ever had any major setbacks? What were they and how did you overcome them to get back out there? SH: A few years ago, I experienced my first running injury, IT Band Syndrome. It is a common and painful knee injury known to runners and athletes alike, and can derail your training for months. My injury forced me to stop running and start a physical therapy program to rehabilitate my knee. I was not able to run more than 2 miles before I had to stop altogether. Thankfully, my therapy was successful and I was off and running again. That is, until those 2 surgeries mentioned earlier. I’m dealing with the same injury now, and have taken the necessary steps to healing. FFFC: Do you run races? What are some of your favorite races? SH: Do I run races you ask? Well yes I do! Short and long mile races, and just for fun races as well…from a 5k to Half Marathons, and relays to Color Runs. Cross your fingers because I’ll be adding a Marathon to the list shortly! FFFC: Do you have any upcoming races planned? Share the event details here. SH: There are 2 races left in my run season for this year. The Trenton Double Cross Half Marathon & 10k will take place November 9th. The course starts at Arm & Hammer Park, through Trenton’s historical districts, across 2 bridges, and back into Arm & Hammer Park, home of the Trenton Thunder. I’ll be running the 10k as a taper run to my upcoming marathon. I will be running my first marathon, Sunday, November 17th in Philadelphia. The Philadelphia Marathon runs through Fairmount Park and along the Schuylkill River, historical districts and neighborhoods such as University City and Manayunk, finally ending at the Art Museum. Typing this just made me nervous! FFFC: Who helped you as you developed your running skills? SH: I’ve gotten great support from my fellow BGR members. Outside of my own workouts, our ambassadors and run coordinators have done a wonderful job of scheduling focused and targeted run workouts as well as run clinics. There’s also a wealth of go to information that I’ve found particularly useful on websites such as Runners World.com, Active.com and Competitor.com. There are several sites, but these 3 come to mind. FFFC: Any advice for someone interested in starting to run? SH: Just get up, get out there, and move something. Commit to changing your life permanently simply by running, walking, jogging or wogging. There are some who frown at the idea of running, and I can imagine that the thought of it to some, would be somewhat intimidating. You have to crawl before you walk, and you also have to walk before you run! Many runners start out walking first, and in fact it is encouraged. A sense of accomplishment comes as you increase your endurance or reach a milestone. In this age of technology, there are apps that can get you started. One in particular and is very popular, is the Couch to 5k app, lovingly known as C25k. This app starts you walking and eases you into over several weeks. Upon completion of the program, you will be able to run a 5k race (3.1 miles). How cool is that! Running is personal and the right mindset in the beginning always helps. As my friend and fellow BGR sister Renee Lewis-Mance eloquently stated in reference to running, it’s “Adding years to our life and life to our years!” Think on that for a second. Also, there’s a wealth of information out there about what to expect as you start to run…what to wear, nutrition, how to become a stronger runner. Grab yourself a good pair of sneakers and a run buddy, and get out there! SH: My biggest accomplishment to date has been my training for this upcoming marathon. My body and mind has been challenged beyond measure, but somehow I’m able to push through. Some say I’m crazy, but I just say I’m alive. FFFC: Who are some of your running idols (Male or female we don’t discriminate)? SH: Okay, so when I was younger, I thought Cheetarah from the Thundercats was it! But my real idols are greats such as Florence Griffith Joyner, Marion Jones, Jackie Joyner-Kersee, Jesse Owens, Carl Lewis, Michael Johnson and the entire USA and Jamaican sprint team. And last but not least, every Kenyan distance runner out there. In my dreams, I am Kenyan! SH: I’m sure some of my friends are quite fed up with seeing postings of my medals and races I’ve completed. Someone is probably waiting to scream if they read one more workout post on Facebook or Twitter! If they’d like to experience my run journey and see what all the fuss is about over Black Girls Run, or how easy it is to become addicted to running, I’d invite them to join their local BGR group, which can be found on Facebook. 7 Replies to "Femme Fitale Fit Club presents Fierce Women Series - Shakirah Hameed"
Shakirah Hameed is so inspiring! I love her level – headed approach to running. LOADS!! of LUCK to you, Shakirah Hameed on your first marathon. YOU GOT THAT! Absolutely love this interview! She takes you on her journey and speaks about the challenges and successes…. great article and I love how particle and down to earth the advice is. Thank you so much Shakirah for sharing your journey. You are and inspiration! This is a phenomenal blog/article. She really quote, unquote takes off her proverbial clothes and goes full spectrum, telling of the triumphs as well as fears that comes along with being a runner. I can say in the distance I’m “Proud” of this young woman. High remarks to her and accomplished goals and all the best to all accomplishments to come. With her perspective one can say, she literally is in her element. Go Shakirah Hameed!